Person County is a small county located in north central North Carolina, on the Virginia border. The county seat is Roxboro. Person is similar, politically and demographically, to its neighbor Caswell County to the west; Person was once part of Caswell before they were divided in 1791. But Person is whiter and more Republican than Caswell. Person County supports Republicans at the federal level, but Democrats are stronger at the legislative level and dominant at the local level. Democrats are strong in majority black Roxboro and some surrounding precincts but Person’s outlying rural areas are Republican. Once reliant on tobacco, Person County is attempted to diversify and focus on other forms of agriculture. The southern portion of the county contains Hyco Lake, a man-made lake that in recent years has become a popular spot for recreational activities. The county was named for Thomas Person. A patriot and Revolutionary War general, his anti-Federalist views tended to be in agreement with the early inhabitants of the county. Forecast: Slowly but surely, Person County trended Republican until 2008, a result of white voters leaving their ancestral Democratic Party. But white voters are no longer leaving the Democratic Party in significant numbers because most of them vote Republican already, at least at the federal level. 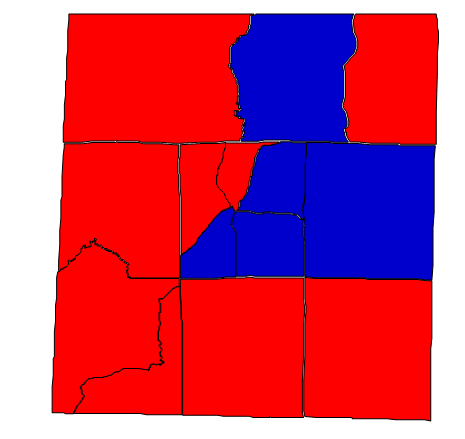 Mitt Romney won about 78% of Person County’s whites, leaving little room for Republicans to improve in the future. Given the inelasticity of Person’s electorate, Democrats are strong at the state and local levels. But Person County whites are too Republican for them to win at the federal level. Federal level races can only be won in landslides or wave years, and in 2008 Kay Hagan prevailed here over Elizabeth Dole by a small margin. Although Person County is too small by far to be of significance in any state contest, if the Republican candidate for Senate next year loses Person then they are almost certainly losing statewide. Going forward, Republicans are unlikely to lose their edge here in federal contests. The 2016 presidential election will probably see a fall in black turnout. Person’s percentage of African Americans is 27%, above average, so Democrats stand to lose here. Person County grew at a rate of 10.78% during the 2000s decade, which is below average. Growth since then has declined, and the county will probably lose population in the 2020 census. Should growth pick up again, expect it to center around the Hyco Lake and the southern portions of the county. Given its proximity to Orange County, the Republican affiliation of affluent retirees in Person is not a sure thing. But that is all hypothetical. For now, expect the political situation to remain the same here for quite some time.